Loo and Gomu are two small ethnic groups living in the Muri Mountains of Northern Nigeria. In the early British colonial era, such "pagan" groups were brought under administrative control by military means, at times with devastating results. New sources – a private letter by a young colonial officer as well as locally recorded songs - make it possible to present such an incident more accurately than before. Loo und Gomu sind zwei kleine Ethnien, die in den Muri Bergen in Nord-Nigeria siedeln. In der frühen britischen Kolonialzeit wurden solche „paganen“ Gruppen häufig mit militärischen Mitteln unter administrative Kontrolle gebracht, z.T. mit tragischen Folgen für die Betroffenen. Durch neu erschlossene Quellen – eine Schilderung der Ereignisse in einem privaten Brief eines beteiligten Kolonialoffiziers sowie lokal aufgenommene Liedtexte – ist eine genauere Darstellung eines solchen Zwischenfalls möglich geworden. 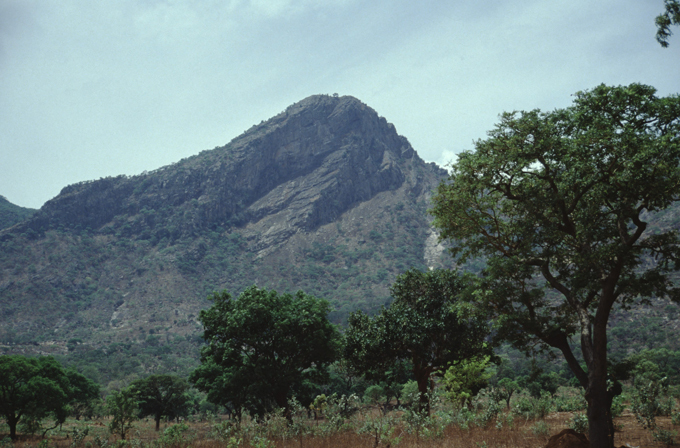 The following text may be regarded as an addendum to my essay "Maxims and Mountaineers - The colonial subjugation of the Muri Mountains" (Adelberger 2009), where the various actions by the British colonial government to bring under political and administrative control the diverse ethnic groups living in and around the Muri Mountains in Northern Nigeria are described. The discovery and subsequent transcription by Richard Fardon of a report on the Gomu incident contained in a letter among the private papers of Hugh Middleton Brice-Smith , a young colonial officer partly involved in the skirmish, has made it possible to present this episode in more detail. The settlement area of the Gomu lies on the southern range of the Muri Mountains, their neighbours to the west are the Leemak, and their neighbours to the east are the Bambuka. Their language is classified as a member of the Bikwin-Jen Group, one of the sub groups of the Adamawa-Gur language family within the Niger-Congo Phylum (Kleinewillinghöfer 2015; Kleinewillinghöfer in press). The Gomu people may number about 5,000 and are subdivided into two sections: Nwatal in the west, and Gongwee in the east. Some of their clans claim to originate from neighbouring ethnic groups such as the Dadiya, Leemak, Loo or Bangwinji. Living close to the Gomu and bordering them to the north are the Loo. Their settlement area is in the basin between the northern and the southern ranges of the Muri Mountains. They total about 8,000 inhabitants and are subdivided into the sections Shungo and Taadam. While the Shungo dwell in the northern part of the area, the Taadam live in the southern part. Quite a number of their clans claim to originate from other ethnic groups, notably from Kushi, others claim to have come from Pero, Kode, Burak, Gomu or Dadiya. The Gomu especially have a reputation as warriors, and, combined with the inaccessible nature of their mountain dwellings, they were able to defend their independence from the Fulani Emirates in the 19th century. Although at the beginning of the 19th century Emir Yakubu of Bauchi had launched an attack on Gomu and neighbouring Kode, taking slaves and burning the settlements (Haughton 1912a), in the following years, however, Gomu successfully repelled the attempts by the Emirate forces to conquer or enslave them. Preserved in the oral traditions of Gomu and Loo, and recorded in the files of the British colonial administration,  but not mentioned in the published histories of the Fulani emirates,  is the following event: in the second half of the 19th century, a raiding party from Muri Emirate, which was roaming along the southern fringes of the Muri Mountains, was severely beaten by the Gomu and their allies and the Emirate raiders suffered the loss of about 150 men. Oral tradition of the Gomu even tells us that the leader of the Fulani, (most probably Muhammadu Nya, Emir of Muri 1874-96), was wounded and could only be successfully treated by washing his wound with water fetched from a source belonging to the Gomu. Gomu and the neighbouring Loo and Burak were never forced to pay tribute to the Fulani Emirates. In their oral traditions their undefeated position is well-remembered. In 1909 an endeavour by the British colonial administration was started to delineate the borders between the provinces of Gombe and Muri and bring hitherto unvisited areas under administrative control. To this end two patrols from Gombe and from Muri met at Gateri to the north of the Muri Mountains on 12th May 1909. The party from Gombe consisted of Assistant Resident of Gombe T. F. Carlyle and Colour Sergeant Bailey with 22 soldiers; the party from Muri comprised Resident Lau Division K. V. Elphinstone, Assistant Resident Brice-Smith and Lieutenant Feneran with 54 soldiers. From Gateri they first went to the Pero settlements of Gwandum and Filiya, and Elphinstone remarked that he found them to be particularly repellent. The next settlements they reached were those of the Kushi and the Burak. The people of Burak expressed their contentment with the new administration protecting them against the neighbouring Loo and Pero, and they prepared a road to Gomu. The patrol then continued to Loo, Gomu and Bambuka. "(...) 5. The cases of truculence mentioned (...) occurred at Kwuntsi and Lo. (...) 6. The latter village (LO) are pagans on the very lowest plane of civilisation. They not only refused to pay their tribute but intercepted the messengers of a neighbouring village who were bringing in their taxes to the Political Officer. For this indiscretion for which the Chief took all blame a fine of 60 spears was imposed. Both the fine and the tax were subsequently paid without any trouble." "27. The following day [23rd March 1915] LO, who before punishment had been inflicted on Kwonchi, according to Native reports, had been preparing to fight, on being sent for came in and brought their tribute for 1914 £14 with them. These people are reputed cannibals and very low in the social scale, but making all due allowance for this I fear that a salutary lesson will someday have to be given them before they will pay their tax without the visible threat of an armed force. This town and Kwode are the worst in the District." "9. Lo (Chongwom) the next place did not at all care for our appearance. However we spent a day there talking and explaining the administration's aim. But we could do little with them." "Now that is all altered as luckily for us they [Loo] elected to assist Gwomu in arms against us and have been taught a lesson. Their manner now is very different." "I have never taken a thorough dislike to any pagan tribe out here before, but I certainly did in this case [Pero settlements of Gwandum and Filiya]. They are perhaps the lowest we visited. (...) But I know perfectly well they are a people who will have to be "broken" before they will do anything required of them." "I very much regret to say that I met considerable opposition. I argued and begged them to stay and fall in with my modest demands but the young men carried the day. After the town had been cleared two counter attacks were made on an isolated section which were beaten off in one case only when the leading man was shot at 8 paces; in this case the attack was made from dead ground through the houses." In the fight, the Gomu were joined by the Loo who were their allies. At the end of the skirmish there were 31 Gomu killed and 19 wounded, and one Loo killed and 9 wounded,  with no casualties on the British side. In the oral traditions of Gomu and Loo it is maintained that one man of the British party was killed or wounded by a spear which had instigated the fighting. The contemporary written sources do not support this view and it seems likely that the oral tradition is adjusted to have a convincing explanation for the brutal measures subsequently inflicted upon them. Ne nyuamo bi ya, Wushiwa? What happened to your mouth Wushiwa? Ne nyuamo bi ya, yinmi? What happened to your mouth my brother? The white man climbs over our farmland. The white man stood up with a baton. The patrol continued to Kode, then passed through Panya, Bambur and Kwonchi and continued on to Pitiko, Bashima, Kirim, Balassa, Ankwara and Ligri. On 27th May the two parties split and the Gombe party proceeded to Tangale country, arriving at Nafada on 14th June 1909. The camp as I had heard was made in the village on the top of the hill on a delightful plateau. 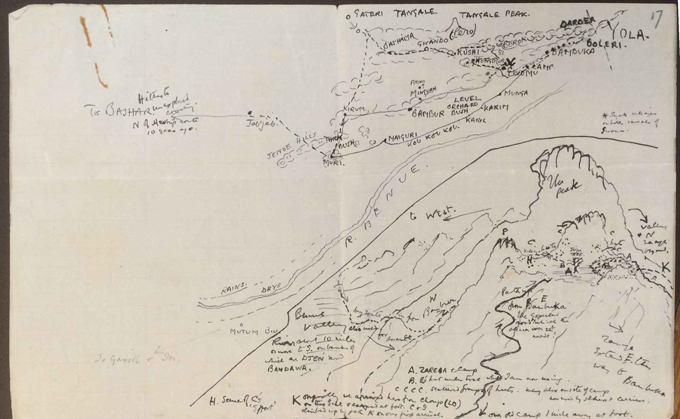 The accompanying sketch and the map will give you a v. small idea of its splendid situation. My arrival was greeted with joy chiefly on account of my beer loads etc. During tea I had a full account of the “scrap”. Gwomu on hearing of their fine had a long discussion with Chongo (Lo) vide previous letters, and some of their allied villages to the W[est]. Lo said “We have never paid to the Filani [Fulani] and, I should certainly not to the white man. We will be charmed [?] to come and help you not to do so”. So fortified with copious drafts of gea [local beer] and doses of JuJu, Lo and Gwomu and others swore a solemn compact and prepared to teach us our position. They apparently stationed an ambush of bowmen (they are really spearmen) on the path E[ast], but unfortunately Feneran [Lieutenant in charge of troops] chose path W[est]! They had a short talk (E [The Resident K. V. Elphinston] and the Gwomurians) and G[womu] refused to let us in and so they had to be moved out of the way and they were! There was one exciting incident. Carlyle [Assistant Resident] had the narrowest of shaves. He had been behaving like a fool and bolting around with a revolver. Finally on reaching the crest at C [referring to a point indicated on the accompanying sketch map], with one man he tried to assault P [another point indicated on sketch map]! and was rushed by 12 frenzied savages. Having got well on in front he completely masked the fire of E[lphinstone]’s men. E[lphinstone] was ordering him back and he was yelling to E[lphinstone] to “come on”. Fortunately E[lphinstone] just in time got in a volley that accounted for 10 of the 12, 1 fled and the 12th proceeded to come to close quarters with C[arlyle]. C[arlyle] then retreated and took refuge behind a convenient hut. The pagan did the same on the other side and they both proceeded to edge round it. As it happened they came out on the same side 8 feet apart and the savage was just throwing his spear when C[arlyle] shot him. The spear left his hand as he dropped. If C[arlyle] had missed or been a second late he would [undoubtedly?] have been “skewered”. Also the spears are poisoned the length of the head. E[lphinstone] and F[eneran] and C[arlyle] then had breakfast and finished the affair afterwards. G[womu] ran to the four winds some actually reaching Djen and Bandawa on the Benue bank! About 400 men tried to hold the hill. This all may sound very exciting but these shows are really very tame and the mater may bear in mind that the risk is nil. The rifles never let them get much inside spear range. In fact in the attacking force of 70 no-one was touched and the show was “quite a good one” as these affairs go. It is only when people like C[arlyle] begin to play the fool that they run any risks. F[eneran] was very annoyed as if a white man had been touched it would have been a serious thing for all concerned. Lots of people disapprove of affairs of this sort but what else can you do? This place had made life a misery for the whole neighbourhood for years. They were invincible practically in tribal warfare and defied us to move them. If we said “very well sit down and keep quiet” and had gone away, they would have not have done so, and the neighbourhood would have said we were frightened of them like everyone else. As it is they will never want another dose. The effect on the surrounding tribes was magical. Lo and Bambuka fell over themselves in their hurry to pay the fine. Deputations have since come in from all sides to pay their respects. Djen and Bandawa at least 10 miles distant, Borok, Kulgari, Bambuka and others. Henceforth the roads in their country will be safe and other pagans in time will come down from the hills and farm in the plain. […]"
3: Drawing by Brice-Smith accompanying the letter to his parents. The lower part, (i.e. below the curved black line), is a panoramic sketch of the Gomu hills, with a view along the southern slopes of the Muri Mountains to the west. Capital letters indicate reference points mentioned in his letter. The upper part, (i.e. 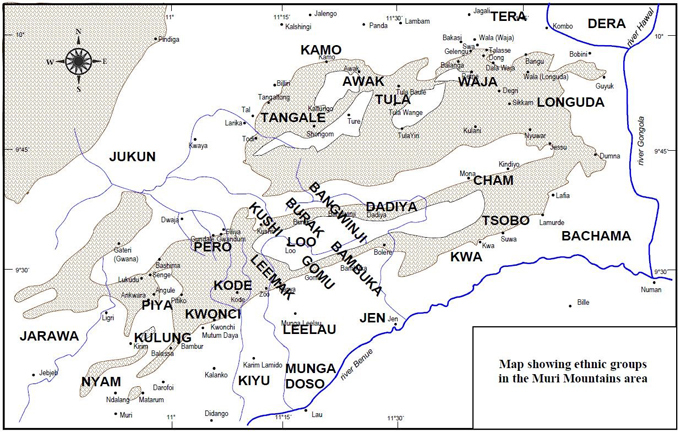 above the curved line), is a sketch map of the area around present-day Karim Lamido in the upper Benue valley. The use of military force was considered a legitimate, political means, especially in the early colonial period. The rationale behind this is to make Indirect Rule work effectively by bringing into the system all elements that escaped the control of former rule. Imposing fines in kind was a common practice in this region in the early days of colonial rule, and local hostilities in particular were fined by confiscating shields and spears. As an example, in 1913 Assistant Resident Carlyle imposed a fine of 300 spears plus 75 shields at Tal-Larika, and 100 spears plus 30 shields at Kalme, both in Tangale country (Carlyle 1913, see also Adelberger 2009). As has already been mentioned above, the Gomu were fined 60 spears (Haughton 1912b) for refusing to pay tax. The confiscation of weapons had the dual effect of both disarmament and a financial imposition. 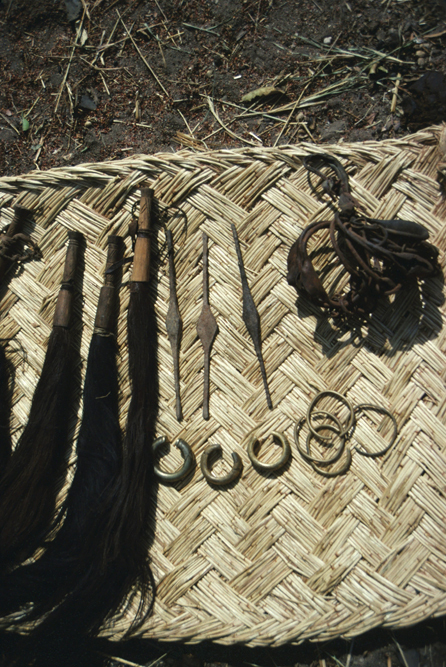 Iron objects such as spears were made by local blacksmiths who were to be found in any of the larger settlements. In 1912, there was a resident blacksmith in 10 out of 12 assessed villages in Wurkun District. Haughton reports that in the Wurkun area, the blacksmiths got their iron from the Mumuye further downstream on the Benue River. Here the Mumuye extracted the iron by smelting black iron sand. The iron was cast into bars about 6 inches long, which were brought to the Wurkun area by the Jukun of Kona. In 1912, such a bar was assessed at having a financial value of 1 penny. (Haughton 1912c, Haughton 1912d). Different shapes, sizes and styles of spear could be found in the area. It seems that a smith would need at least one or two iron bars to produce a spear head, but, depending on the shape and size, it may well have been more. To gain an impression of the economic value of a spear in 1912, the annual tax in Gomu District was 3 pennies per adult inhabitant (Haughton 1912a). This was a rather low tax rate because the area was considered to be poor. The new sources allow for an assessment of the episode: the small ethnic groups of Gomu and Loo, who, due to the remoteness and difficult accessibility of their settlements and also because of their fighting abilities, had kept their independence from the Fulani Emirates of the 19th century, severely underestimated the military superiority of the British patrol. The possibility of influencing the course of events by the Bambuka, who saw here a chance to avenge themselves for past defeats, is quite conceivable. The oral sources point out that the Bambuka informed the British patrol of the perfidy and dangerousness of Gomu. This is also evident from Brice-Smith's letter, when he writes: "Here [at Bambuka] E[lphinstone] found out that Gwomu was a most truculent place which he had not recognized." (emphasis by me). The British patrol was only too ready to break any resistance with violence and to demonstrate its military superiority, in particular with a view to eliminate in advance any further potential resistance by other groups. The skirmish was a traumatic experience for the Gomu and Loo, which has left its mark on the collective consciousness and is still remembered today. University of Oxford’s Bodleian Weston Library: GB 0162 MSS.Afr.s.1845. Correspondence of Hugh Middleton Brice-Smith. http://www.bodley.ox.ac.uk/dept/scwmss/wmss/online/blcas/brice-smith.html. See also Fardon (in press). Further I extend my thanks to Sarki Sule Yerima of Bangwinji for keeping in contact through all the years, to Pete Eccles for proofreading and editing the text, to Ulrich Kleinewillinghöfer for his linguistic expertise in Gomu and Loo, and to the Bodleian Library (University of Oxford) for permission to make use of the papers of Brice-Smith. Extract from report from AR Gombe to Resident Bauchi by Lt. Hugh de Putron, OC Nafada. Transcription of the Loo language and English translation provided by Malam Gaji Golkos. 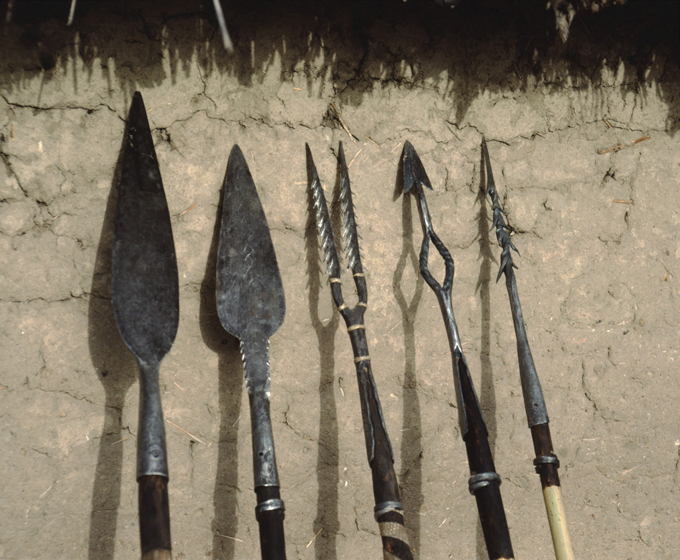 H. M. Brice-Smith donated, among other items, six spears from Gomu to the British Museum. About one spear the accession records state: “This spear was used by a young warrior in an attack by the pagans of Gwomu, Wurkum Hills, R. Benue, N. Nigeria, on a British patrol in 1909. The shaft was bound with grass by the youth’s sweetheart, who instructed him to return it to her steeped in the blood of the enemy. The young warrior was killed in the action.” (see Fardon, in press: 19). This is another token of the individual tragedy inflicted on the Loo and Gomu by this incident. Transcription of Loo language and English translation provided by Malam Gaji Golkos. See also Fardon (in press). For Carlyle’s actions in the area see Adelberger (2009). Seizing substantial numbers of arms in cases of violence was part of the standard procedure defined by Lugard (1970:257) in his instructions to Political Officers (the first edition was printed in 1906).